Been thinking about narrative voice again. I already wrote about how it's the make or break of a book for me. And the thing is, not to be over-obvious here, but every book has a voice. It's not always as in-your-face as, say, Lemony Snicket (oh how I love Lemony Snicket), but there's no such thing as a transparent narrator, unless you just avoid looking at/listening to the narrative voice, which I think maybe sometimes we do: about which more below. First though: am re-reading 100 years of solitude right now, in translation, so of course I can't say anything precise about the music or diction. But in translation the narration's most distinct characteristic is the narrator's weird, outside-of-time perspective--its crazy temporal distance for the events it recounts. It's a much more genuinely God-like view than the traditional omniscient third person, because you are reminded over and over that the narrator can see all of time, all at once, and is not caught in time with the characters. He (oh let's call the voice 'he') lures you into sharing that view when he refers casually to events that will not happen for scores of years--what one character will think on his deathbed; how another will continue with some decision until she dies. You learn that 17 Aurelianos will be killed all in one night, and you think that's all you'll ever know of them. But then 100 pages later you begin to get to know the 17 Aurelianos, and it kills you, knowing what will happen to them. I guess what I'm saying is that if you're just reading for the story or the characters of this book, you'll miss a lot of its pleasures, which is maybe why 100 years of solitude's SparkNotes has a slightly higher Goodreads rating than the book itself (H/T to my husband who pointed this out to me.). Do I sound like your most spoilsporty, least-favorite English teacher? I feel like I sound like that, bah. 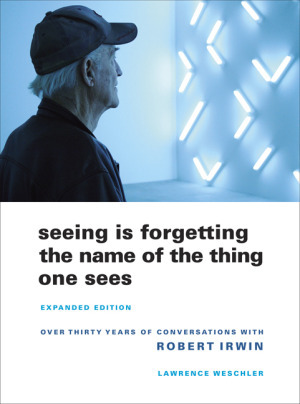 This all comes because I've been reading through excited pencil notes I took a few years ago from the book Seeing is Forgetting the Name of the Thing One Sees, Lawrence Weschler's brilliant biography of the abstract painter Robert Irwin. That book broke my head open a few years ago--you know how sometimes you can acually feel the sledgehammer crash through and the light pour in. one of those where [the artist has] made a line down the center, hard on one edge and soft on the other, across a large field of, say, red. If as a young artist you were to take that seriously as a purely aesthetic experience – how that line coursed through that space, what its relationship to that physical world was – then, given what I’m adding to it, it would be very difficult to understand how they could hang that painting on those two rods coming down from the ceiling: How were you supposed to separate the line in the painting from the rods on the wall? [me again]. The voice of a narrative is not the same as the frame of a picture -- it's more akin to line or color, I guess. And yet a lot of readers seem able to set voice aside. I say that because holy smokes, some books with pretty stupid voices are awfully popular. And I would like to be the spoilsport who urges everyone to consider paying attention to the voice, after all, not to please me-as-snotty-English-teacher, but because the voice offers so much information and so much pleasure, and because arguably it's not good for us to shut out swaths of what we see because we've mentally declared them meaningless. [this is Irwin] . . . when you have a construct like that, that's how you go through the world. In other words, you don’t just do it when you're looking at painting. We’re talking about a mental construct to which the whole civilization has deeply committed itself. And what it says, simply, is that as I walk through the world, I bring into focus certain things which are meaningful, and others are by degrees less in focus, dependent upon their meaningfulness in terms of what I’m doing to the point where there are certain things that are totally out of focus and invisible. Don't get me wrong: I love story and character and dialogue an all that. I guess I'm just putting in a plug for curiosity and open eyes and the more hidden pleasures of narrative. Long time no see. I was doing a tricky revision for most of February, and then I was in Ireland for a couple of weeks, researching my second book. (That period should really be a !, which is more how I feel about being able to take that trip.) It was gorgeous and terrifying--the left-hand driving at highway speeds on tiny shoulderless roads was the terror--and tremendously useful. Anyway. I am now on a mission to post on this blog at least once a month -- I realize that's a low bar, shut up: I am like a nervous second grader, I need ACHIEVABLE GOALS to boost my confidence. I am also going to tweet more often. Yeah you've been warned. The point of both exercises is to meet writers and readers. I feel like there's this giant Intenet cocktail party going on and I'm sort of hovering at the edge of people's tables, eavesdropping, hoping they'll notice me; and then if they look over at me, I'm quickly looking away. Because I am 13. Anyway: so more blogging! I want to talk about stories. But for now, some Ireland pictures. Ross Castle in Killarney National Forest. I have to say well done (or Fair play to you! more Irish-ishly) to my super-cheap Canon point & shoot. That's a two-way road, just FYI. Shirley Jackson's Haunting of Hill House knocks me out because of its brilliant narrative voice, and maybe it's all about voice, for good or bad, in every book I read, for me. Wee blog post: I like sitting in closets, with bonus yearbook photo. Getting stuck in vs getting stuck, with bonus synchronistic raven.